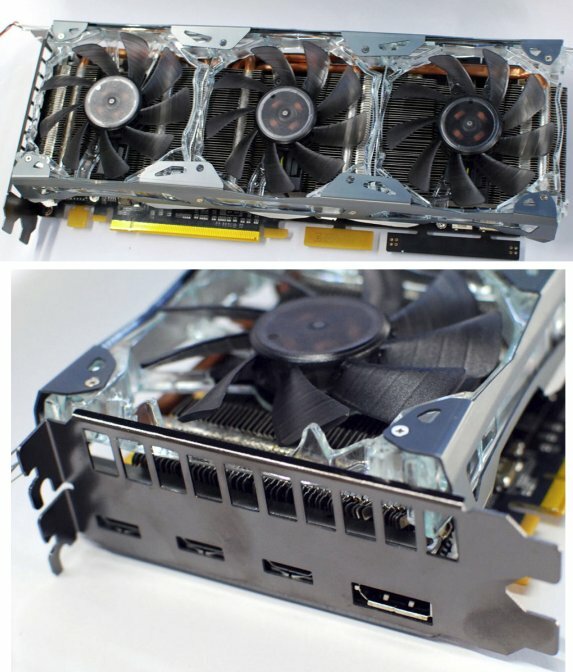 TPU noticed Galaxy has cooked up a new GeForce GTX 580 model with three mini-HDMI ports and one full-size DisplayPort. Pricing and availability is unknown. To begin with, it has a redone display logic that gives it a total resolution of 5760 x 1080. This means that three 1920 x 1080 displays can be connected to it without needing another card. Its display outputs include three mini-HDMI and a full-size DisplayPort. Display management is backed by Galaxy's in-house EZY display setting software. The card uses a massive heatsink to which heat is fed by a number of heat pipes, and ventilated by three 80 mm fans. The frame around these fans is made of clear acrylic, and is studded with LEDs, to give the card a groovy blue glow during operation.